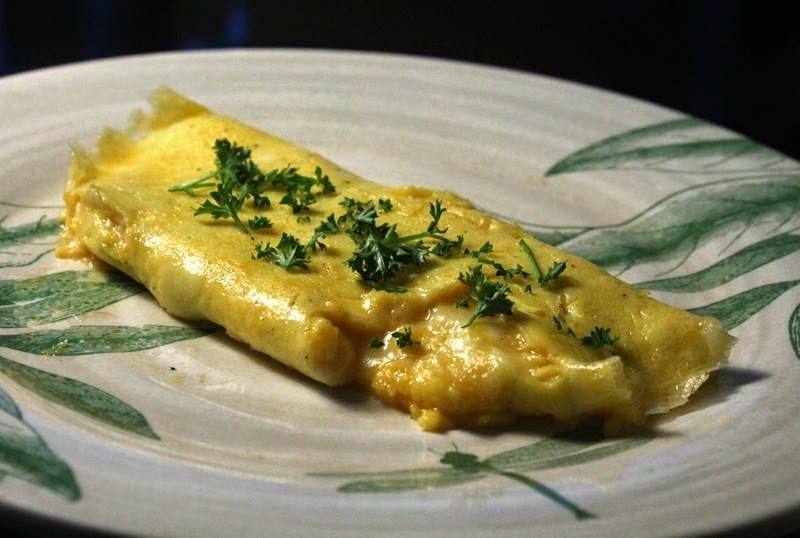 I have to give it up to Chef Ludo Lefebvre for this luscious French-style Cheese Omelette recipe, that my own version is based on. He trained and cooked in France until making Los Angeles his home. You may know camera-ready Chef Ludo from his cooking stints on the Food Network and as a chef/mentor of NBC's The Taste. I'm used to American diner-style omelets that are cooked well done and dry, except for the soft melted cheesy interiors. I always liked my omelets that way, until I watched his own recipe video of how to make the perfect French omelet, his way, and then tried it out for myself. Click here to see what I mean. Ludo, you have opened my eyes and changed my taste for a simple omelette -- hey, I'll even give you props for changing the way I'll now spell the word, from omelet (sic) to omelette!! What's different is the way his omelette is cooked. 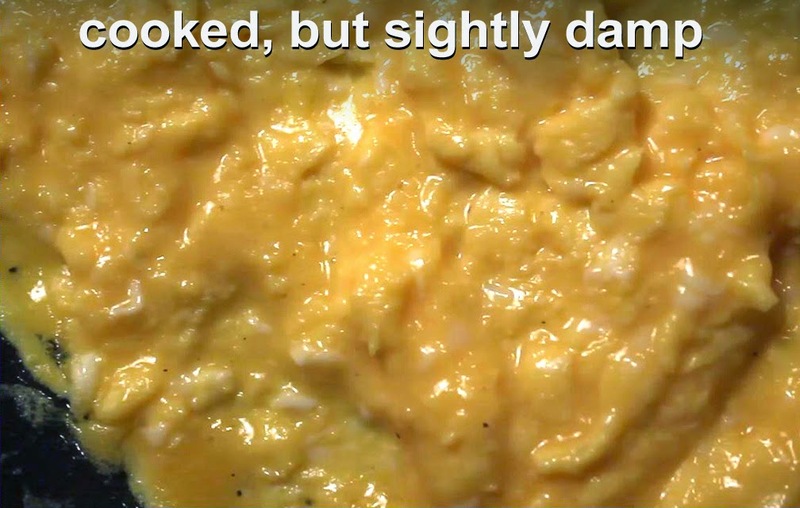 Mainly, you soft scramble the well mixed eggs, add the cheese while the egg is slightly damp, then gently roll it up. Of course, American tastes blanch at runny eggs. But the egg is cooked and warmed through, just slightly damp, and this makes all the difference. But if you insist, you can continue to cook the omelette to your desired doneness. Chef Ludo also cooks the omelette in lots of butter. And he uses a soft French cheese called Boursin (similar in texture to cream cheese.) For my recipe I just used easy to get Italian shredded mozzerella. You can use any soft cheese you like. I think the main thing is how lightly the omelette is cooked. He finishes the omelette with a smear of butter and tops it with chopped chives. For my recipe I skipped the butter finish (gilding the lilly, methinks) and used a little chopped parsley, instead of chives, as a topping. 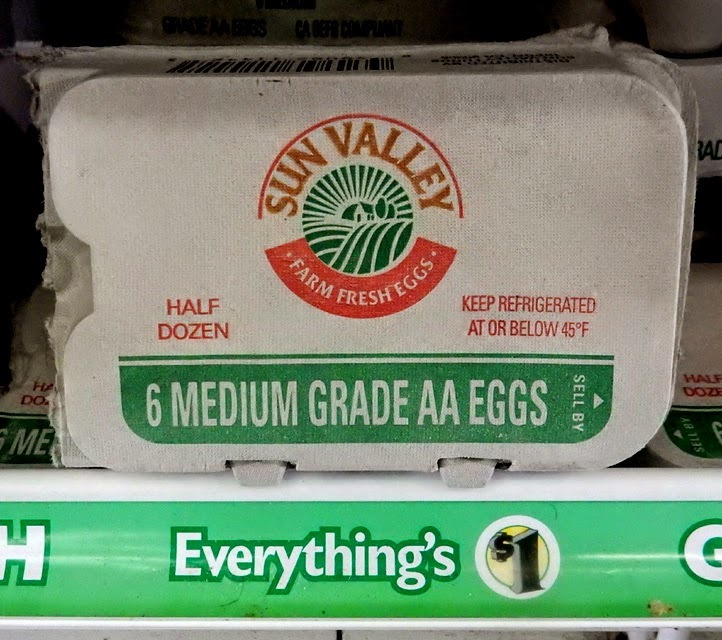 Eggs are still priced reasonably. I can buy a half dozen size container at my local Dollar Tree store, sometimes. 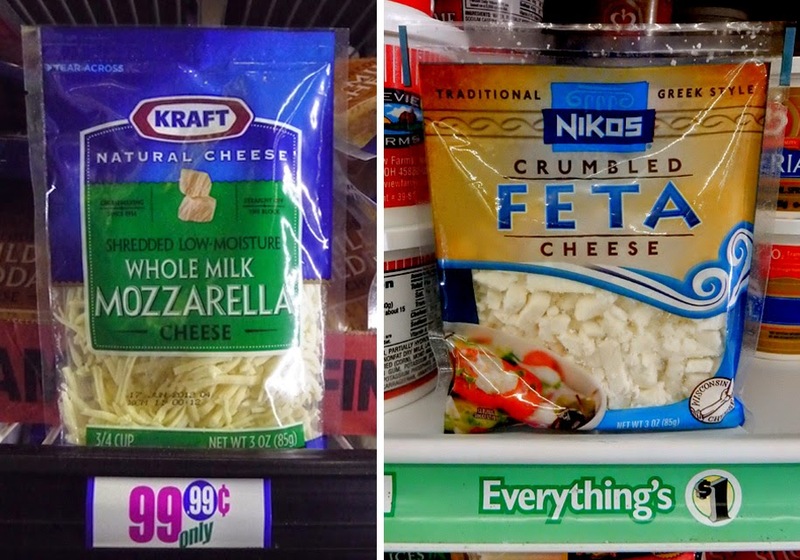 I always find small packages of cheese cheaply. This omelette is versatile. You can also add some sauteed spinach or mushrooms. If you have any favorite omelette ingredients, then try them out, too. 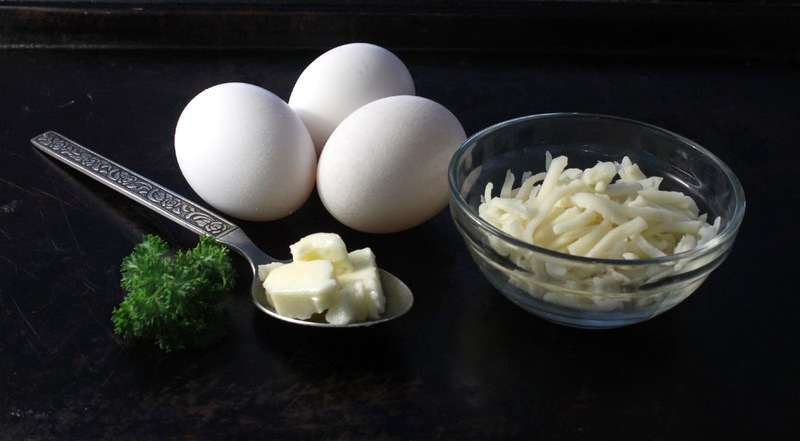 Any way you spell it, omelette or omelet, this recipe is one you can take to the bank! A buttery soft scramble with cheese makes a luscious breakfast. And, here's my Americancheap$kate video recipe below. 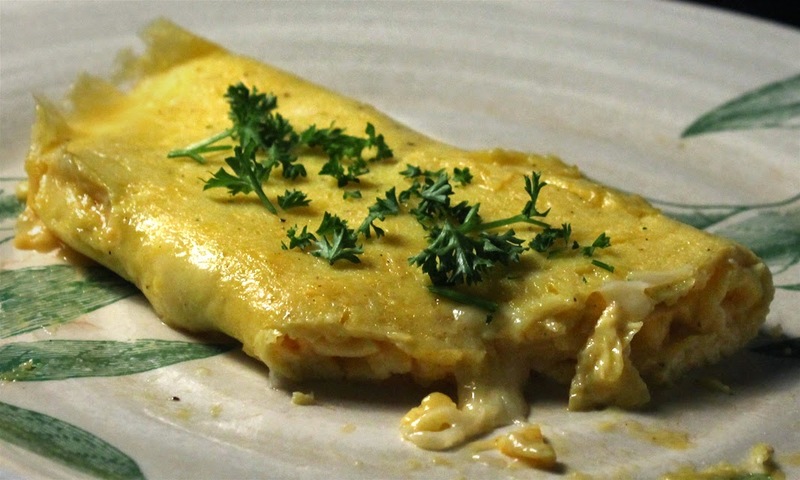 Once you try my version of Chef Ludo's French-style Cheese Omelette you will cry sacre bleu! And bon appétit from this Internet Chef. Play it here, video runs 2 minutes, 27 seconds. 3 eggs - I used medium size eggs. 1/4 cup soft cheese - Add more or less to taste. Any favorite is fine. I used shredded mozzerella. 1 tablespoon salted butter - If you use unsalted, then add a little salt to egg. Okay to use a butter substitute, or just plain cooking oil. But, butter does add a lot of flavor. Pepper to taste - I left out salt. I find the cheese and salted butter is enough. A few chopped sprigs of parsley or chives - optional. Sprinkle on the omelette when serving. For this recipe it's best to use a non-stick frying pan, (8 inch diameter.) For a regular pan you can use more butter (or cooking oil) as needed to keep the cooking eggs from sticking. Crack open eggs and add to a bowl. 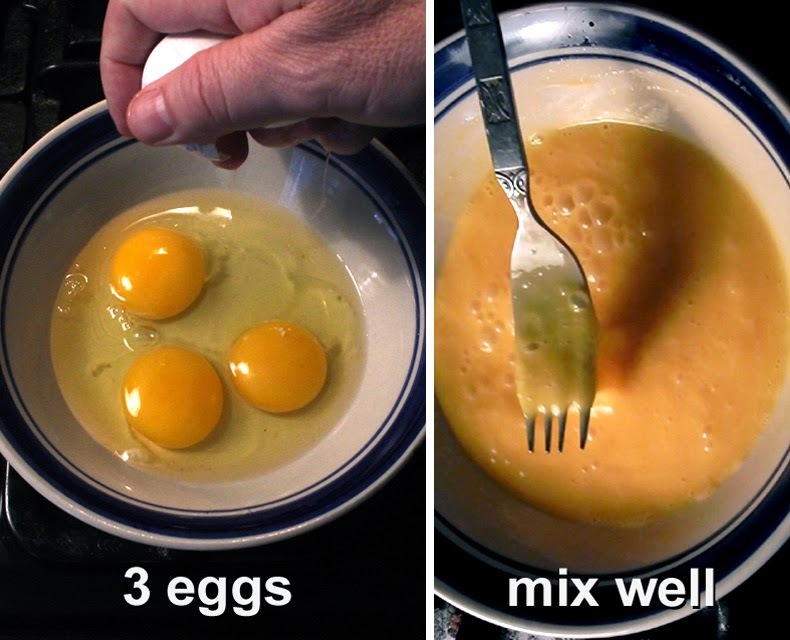 Whisk the egg for a minute to mix completely. 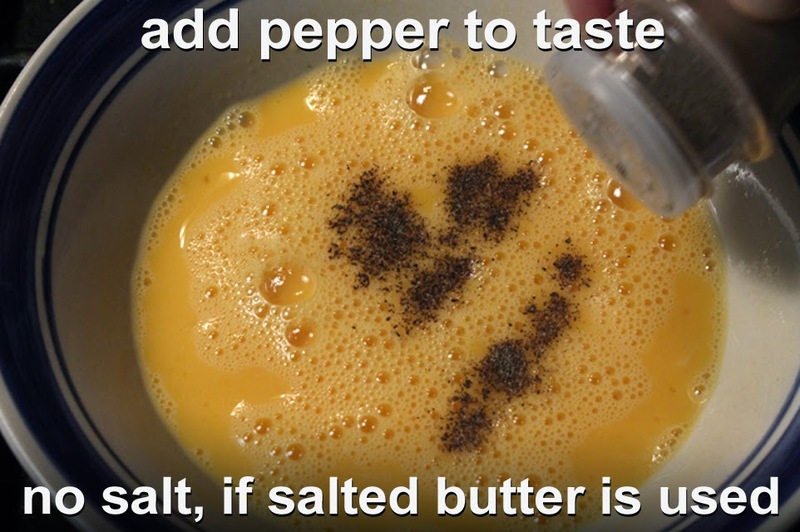 Add pepper to taste to blended eggs. If you are using unsalted butter, then you can add a pinch of salt. Add tablespoon of salted butter to a medium hot pan. Reduce heat a little, when the butter melts. 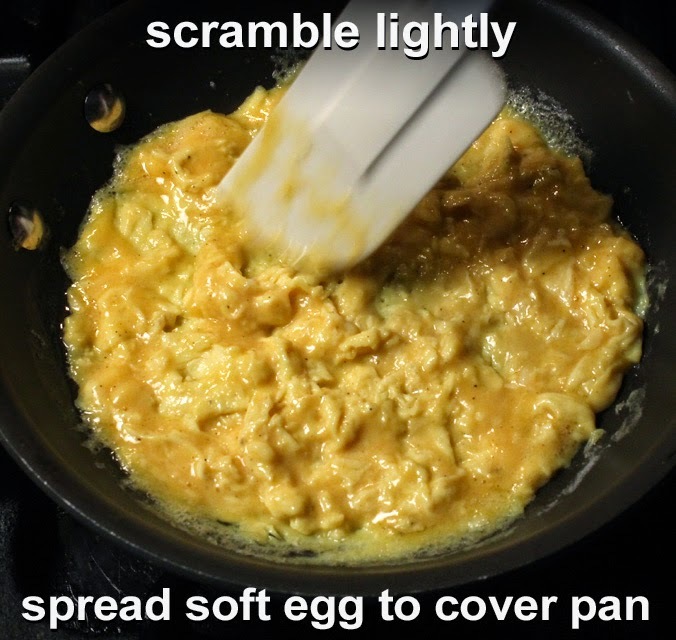 You want a pan that's not too hot, so you can watch the eggs form a soft scramble. The trick is to gently stir the heating eggs, but keep a solid layer of egg to add the cheese onto. The egg is heated through, but not cooked all the way, yet. Add the cheese when the egg is still slightly damp. Now you just gently roll up the omelet. Just lift the edge of cooked egg and fold it partway. Keep rolling to cover the cheese. When the omelet is rolled to the other side of the pan, it's ready to serve. I like my omelette slightly damp and creamy inside. If you like your omelette well done, then keep cooking it for another 30 seconds to 1 minute longer. You can flip the omelette over to cook thoroughly. Check for desired doneness by slicing into thickest part of omelette.